It’s Tuesday and the last of you are likely heading back to work today! Don’t worry, some of us have been working for an entire month now! 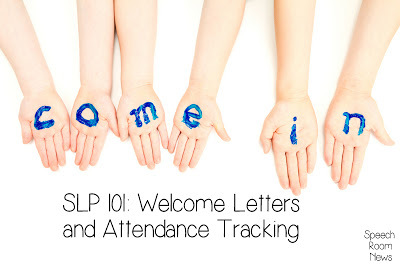 I’m continuing the SLP 101 series this week. We started with Interviewing and Salaries. My last post started getting you settled in getting started in the schools. In that post I told you how I get started. Create a caseload list: I make 3 lists: alphabetical, by IEP date, by re-evaluation date. Set up meetings for any immediate needs (this might include transfers into the district – they often need to be done immediately before you can begin services). Create a Welcome Letter and gather any other information to send home and make folders. Develop lesson plans for the first week. 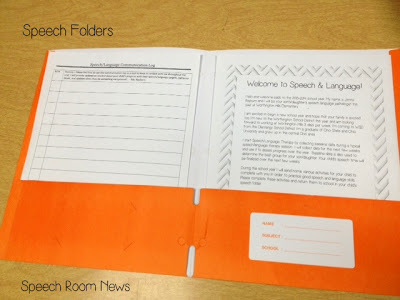 Folders: I use a speech folder for every student at the beginning of the year. Some students will return them weekly and some folders will never make it back into my office. I don’t stress about it, but do encourage kids to bring their folders. I start the year I included two forms in that folder. Writing a Welcome Letter is an easy way to introduce yourself. Especially important if you’re new to the district this year. Since I’m new I included some basic information about myself. Parents often really want to know their child’s speech time, but especially when new to a district, your first pairings in groups might not work out. So I include information about gathering baseline data to determine the best fit for groups. Once I have a more finalized schedule I write their times on the folder. 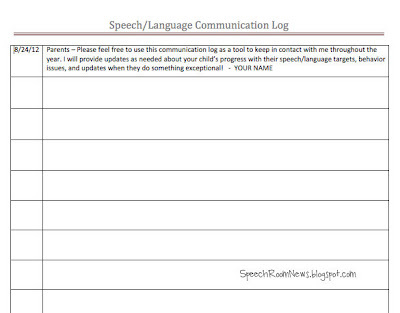 I also use a Communication Log This is a super easy way to communicate with parents. You can download it for free in my TpT Store. 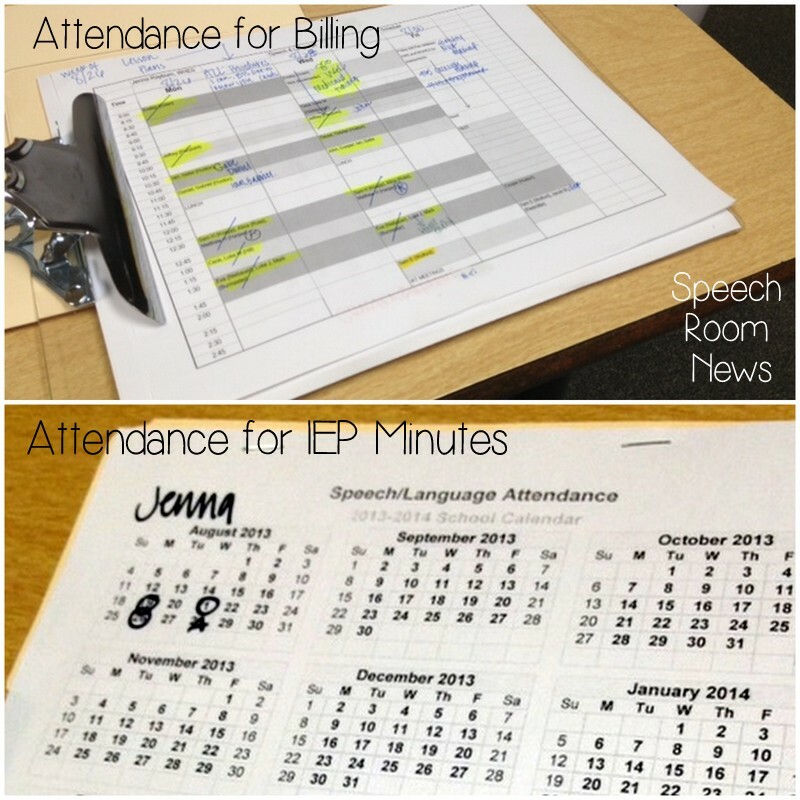 Attendance/Billing: I keep attendance in two ways. Both quick and easy in order to facilitate billing and monitoring serviced minutes. In my district I am required to bill Medicaid for every service I provide. In Ohio we are not allowed to know which students receive any medicaid money, so we bill for every student. To keep attendance for billing, I print my weekly schedule and highlight names to indicate a student attended that session. I make notes if they miss or I miss. Once I enter the billing information into the computer, I slash through that group with pen. You can see I billed some of last weeks groups already. Check with your district for their billing requirements. It’s easier to bill as you go, and not get way behind! 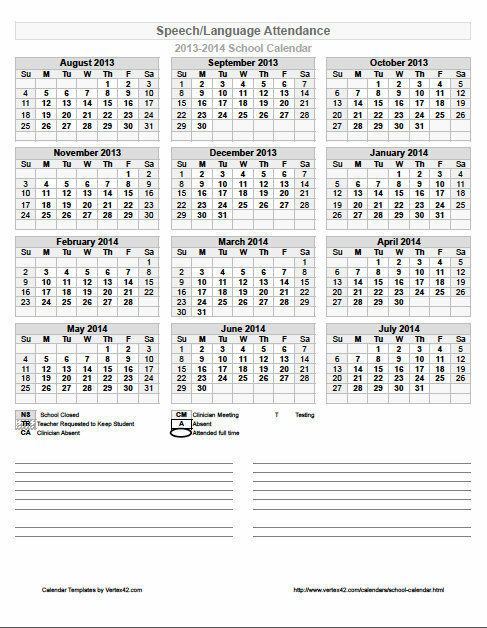 I also monitor attendance with this quick yearly calendar. This helps me monitor IEP minutes. I have the student’s name at the top. I circle the date to indicate attendance for the full time. I write other notes to indicate absences. So in this example the student ‘Jenna’ attended 3 session and was absent once. At a glance when I open the student’s working file I can check the minutes of service for that month. 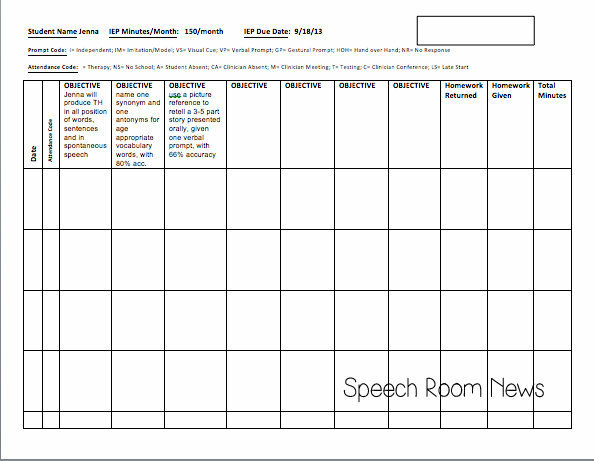 You can grab the Speech and Language Attendance Calendar for free on my TpT Store. It includes the template name at the bottom if you want to customize it different that I did. 504 students/FM systems: Every district is different, so check with the other SLPs to see if you are responsible for any 504 students or students with FM systems. Sometimes the SLP is the person to get the FM system set up, a critical things to take care of before the first day of school for students! Data Sheets: A while back I shared my data sheets with you! 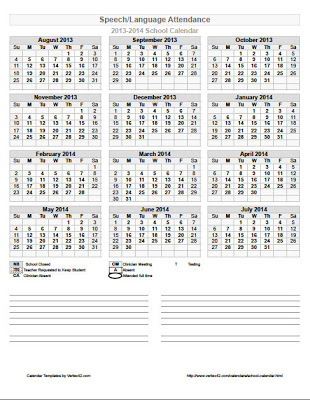 Just follow the link to grab the Free Template for yourself! Ok! That was another jam packed post! We’re almost through the ‘to-do’ list! Next up, I’ll share my scheduling system. I’d love to know where you got your zig-zag background and border for your organizational stuff, and what program you use to make such cute things! I am constantly looking here for inspiration and TPT things, and I love that background… I would love to use it on all my binders! I do my attendance the same exact way and it has worked great for a few years now! On another note…I can’t even wrap my head around the fact that you are not allowed to know who to bill Medicaid for, so you have to bill every kid! That is crazy! Billing for the entire caseload is PAINFUL. Not an enjoyable part of my day! I then type a reference sheet with this info for my caseload. It comes in very handy!!! Love it Kay! Good idea! Jenna, I can’t believe you have to bill for every child. That’s crazy! I’d probably find a way around that issue. Can’t you talk to your supervisor? Do you use this same service we use in Illinois? I’ll look up your kids for you. Sshhhh don’t tell anyone!! It’s horrible! It’s a state law though. Every SLP I know in Ohio bills for every student. We might be grouchier than the rest of you! It’s mostly annoying when they try to spin in and say ‘this way you don’t have to monitor it as kids come on/off Medicaid because you just bill for everyone”. UH HELLO!!!! You’re not alone…we have to bill for every student in NC too. So frustrating! I have to bill for each student as well. At the beginning of the year when I do my master schedule I plot each students minutes in a spreadsheet M-F assuming each student attends. Then I paste this into the month’s billing. Throughout the month I just write down who was absent and what date or if I had a meeting and then delete from my spreadsheet. Of course new students have to be added and students that exit need to be removed, but it has worked out pretty well for me. We also have to bill for every student. My tracking system is similar to your second calendar system, but I have a grid set-up with rows of empty boxes with the days of the month written along the top and month names on the left – I put one slash mark for a full session, and then slash the other way when I’ve billed for it (making an X). If the session doesn’t happen, I put in a one letter code for the reason so I know whether I need to make it up. 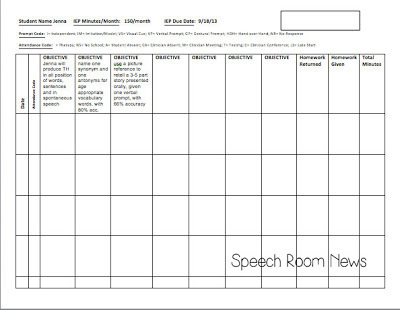 I have one for each student and on the bottom of the page I have a place to check off when their quarterly reports are done, when their annual IEP is due, info on their 3-year re-eval due date, etc. Jenna, where do you keep the students’ attendance and data sheets? Do you take them out of their working file each time you see them? I love the idea of adding the QR code! That is just fabulous! How did you do it though? I am SO copying you. Thank you for sharing! 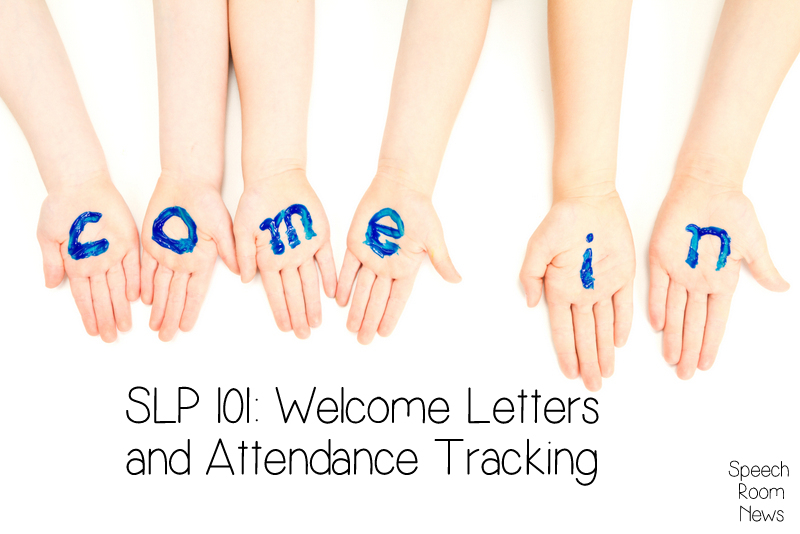 Love your ¨welcome letter¨! I absolutely love your blog and have been stalking it for a few years, and today I had to giggle a bit when I read your 101 series because I do some of the same things that you do with my spreadsheets. I’m always using spreadsheets to sort my information. Sometimes I think I am so analytical that I cannot get myself organized properly. Even though I am a veteran SLP, I am always looking for validation that my ideas are valuable or “good.” I just want to thank you for sharing all your wonderful ideas, routines, procedures, etc. Thanks for that lovely comment, Amy! You are awesome! I just accepted a school position for 2018. I am coming from adult OP with occasional pediatric OP experience over the past two years. I am thrilled to start at the school, yet incredibly nervous about all the organization/deadlines and scheduling! Thank you for all your posts. I am feeling less anxious by the minute as I read through them. THANK YOU! Hope you are doing great and enjoying your summer! You’ll be fantastic! Hope the year is starting well! Do you have a supply list for your students? Do you require them to bring things in at the beginning of every year at the elementary level? Or do you just have the communication folder? How do you get that barcode on the letter for easy scanning?! That’s awesome. P.S. 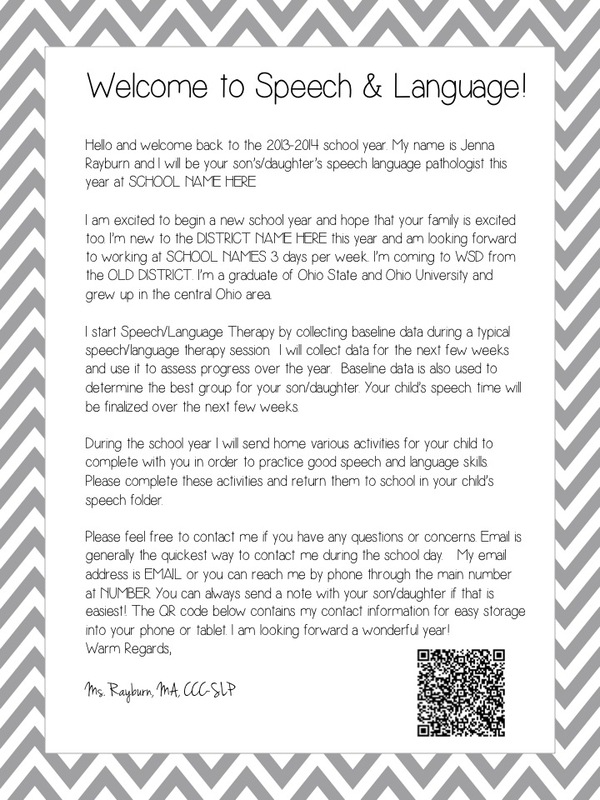 I just discovered your blog today and I’m in speech heaven! Love it! You can use any QR code creator!